IKEA - Sneak Peak for Winter '06! IKEA contacted the press yesterday with new products for Winter '06! Here's a sneak peak at some of my favorite products, the swan would be so pretty tied to a box for a present, or to a favor at a baby or bridal shower, don't you think? For $2, the s+p shakers have the cutest shape and would be a great spare set for outdoor dining on the patio, or useful for using daily on the kitchen table. 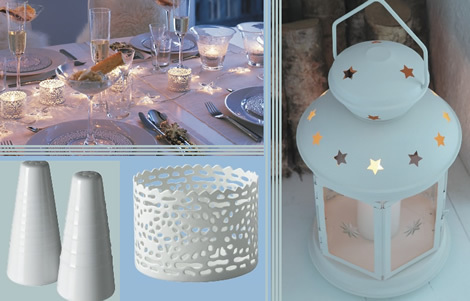 Did you spot the ceramic tealights with the cut outs, and for $1, they are quite a budget find for casting romantic light around the table and on the ceilings and walls. Pretty for the table, the mantle, or use several around your bathtub. The tall clear vase with the lacey insert is another lovely find, too. 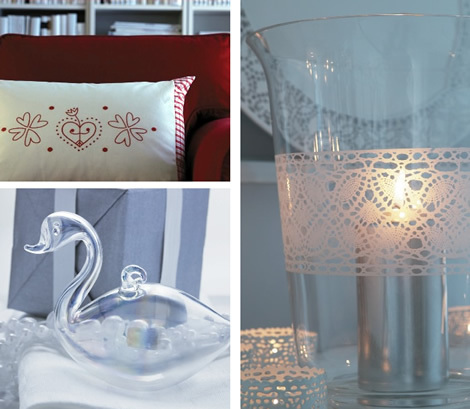 Pillows, wine glasses, lanterns, candle holders, chairs, tables, and more for Winter... IKEA is really dressing things up! Be on the look out either on the IKEA website or in your nearest store for these lovelies, which should be popping up everywhere in the next few months! See Jane Work - Newbies!